Before you sell your old or damaged Fuso truck, as a smart consumer it is your right to know why to choose a certain Fuso truck wrecker in your area. There are several old and scrap Fuso truck wreckers out in the Melbourne market which promises great service and offering top cash for your old Fuso truck. Here at Fuso Truck Wreckers Melbourne, we provide top cash and quick, efficient service for your Fuso truck wrecking needs. We have been catering to the Melbourne area and its suburbs for more than 10 years and our invaluable service and loyal customers are the main reason why we are still thriving in this business. We can pay as much as $13,999 for your unwanted, damaged, wrecked, old or used Fuso truck. Just call us and we are at your disposal immediately! Cash for trucks Melbourne provides top cash for any make & model on the spot. Here at Fuso Truck Wreckers Melbourne, we ensure that we provide and offer fast, reliable and efficient removal and truck wrecking service. You can sell your Fuso truck to us regardless of its year, model and mechanical issues. Just call us and we will pay you cash for old Fuso truck! We don’t only pay cash for old trucks but we also give cash for scrap Fuso trucks! There is no need to leave your scrap, unwanted, written off or damaged Fuso truck in your driveway, there is no need for you to keep worrying about how to get rid of your unwanted vehicle. We will take it off your hands – and we will pay cash for it! 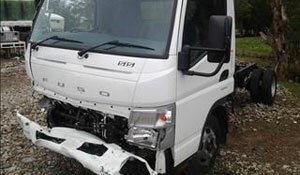 If you have decided to sell your unwanted Fuso truck, there is only one name to call – Fuso Truck Wreckers Melbourne. So if you are looking to sell your Fuso truck just give us a call at (03) 5990 3170 or fill out our online form to get a no-obligation quote – sometimes we would need to come down to your location and conduct an actual inspection and we will give you the final price for your Fuso truck. Once you have agreed, we will get rid of your unwanted or damaged Fuso truck from your hands and pay you cash for your truck. We have 2 major branches Melbourne Wide. Fuso Truck Wreckers Melbourne pays top cash for trucks in your local area. No major paperwork required when selling your scrap, used, or broken truck to us. Don’t wait to sell your truck before it gets rusty in your garage.